If you were impressed by Hercules’ travel agent in Hercules Vs. The Sons Of The Sun where we saw the gargantuan galoot hit the shores of South America in search of a healthy workout, The Witch’s Curse may be another vacation you wouldn’t mind taking. This time it’s fellow strongman Maciste and he’s put through his paces as he travels into hell to foil a curse put upon a town by a witch. A town in Scotland. Scotland? As in Loch Ness Monster Scotland? As in “on the other side of the continent from Italy and Greece” Scotland? And in the Middle Ages, too? Whatever happened to that oiled up stud who ran around liberating places like Thebes and Mycene, driving chariots, and going skin-on-chiseled-bronzed-skin with monsters like Antares and the Moloch? Never fear because in spite of everyone else in Maciste’s Scottish village dressed up like extras from a Vincent Price–Roger Corman picture, Maciste is still decked out in skimpy brown loin cloth and isn’t afraid to heave stones and trees around when need be! Those of you hoping for some type of explanation as to how it was that Maciste just happened to be wandering around the Scottish countryside at precisely the same time as a hot young thing was wrongfully accused of being a witch and in need of rescue are obviously new to this genre. Usually, the best these flicks can offer in terms of explanation consists of some musclehead showing up at the troublespot, quickly uttering something along the lines of “I came as soon as I heard there was trouble” and immediately shifting back into “heave and throw” mode. The Witch’s Curse doesn’t even bother with this! Maciste shows up, the town doctor tells him that some crappy witch they torched last century put a curse on the town and only by getting the curse lifted can the girl be saved. Maciste is one of those can-do kind of fellows and once the haunted tree is pointed out that’s giving the town so much trouble, he lowers his shoulder and tries to uproot it. Then he pushes it. Then he tries to lift it. Just when it looked like Maciste had spent the last few months trying to pass a steroid test, he manages to make it budge enough so that a hole beneath it opens up. 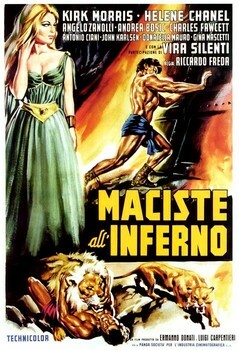 Maciste hops on in and finds himself in hell! Right there under a tree in Scotland! Just like it says in The Bible! Maciste regains his memory by gazing into a pool of water that just happens to be playing highlights from some of his previous adventures. And even though star Kirk Morris played Maciste something like seven times in his career, none of the flashbacks are from Maciste movies that he was in! One of them, Samson And The 7 Miracles Of The World, starred Gordon Scott, but was at least directed by Ricarrdo Freda (I Vampiri) who also made this one. The other movie, apparently Atlas In The Land Of The Cyclops, wasn’t even directed by Freda, but did star a guy named Gordon, but not Gordon Scott! That would be Gordon Mitchell of The Giant Of Metropolis fame. Somehow, seeing clips from his colleagues’ past films jogs his memory and Maciste gets back on the case. Morris (Colossus and the Headhunters) displays a pretty limited playbook in this movie when it comes to studly displays of superpowered he-man mayhem. With him bopping around a big cave the entire movie, his moves consist mainly of chucking rocks, stone columns, and getting buried in landslides. He does bust out his top-secret ability to jump really far after a giant wrecks his efforts to cross a chasm with a big log. Morris’ dialogue is fairly minimal which is a good thing since the few times he opens his mouth to let the dubbed lines pour out, he looks half asleep. I think it says something important that someone could see Morris in action here and say to themselves, “here’s a guy we should put in eleven more films exactly like this one!” Something important like it was an awesome time for us muscle fetish guys to be alive! Cruddy in both concept and execution, The Witch’s Curse nevertheless manages to evoke enough chuckles (watch when Maciste fights the giant and try not to think that it isn’t just some little dude in a bad wig fighting a regular-sized guy) in its mercifully brief 75 minutes (the original version, Maciste in Hell, is several minutes longer) to make it a worthy second feature on Something Weird’s DVD of the entertaining Hercules Against The Moon Men. And if there’s one moment in the flick that makes it all worthwhile, it has to be where Maciste is almost stampeded to death by a herd of steers thundering through the caves of hell. It’s beef vs. beef! Thank goodness he was able to fend them off with the big stalagmite he picked up just in the nick of time!